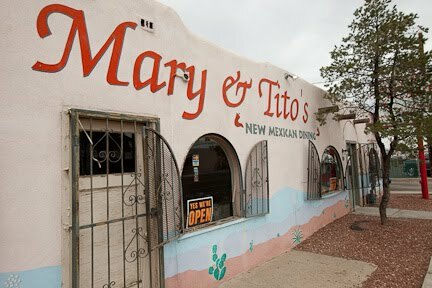 We’ll start off this tummy/palate pleasing project with Mary & Tito’s in Albuquerque. Serving up traditional New Mexican cooking that just received a James Beard Foundation award for being an American Classic. While the starter basket of chips had a nice, simple salsa, the chips were stale. Must have been due to the rainy day in the Duke City. The Carne Adovada Turnover and the stack of cheese enchiladas with a fried egg, both with red chile, made us forget the stale chips. 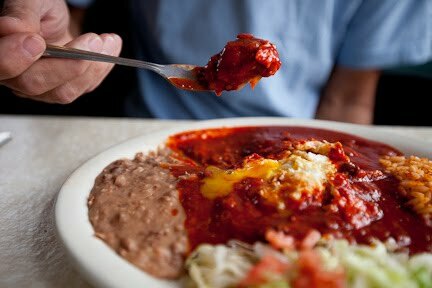 Probably one of the tastiest red chile sauces I have eaten (and I make a pretty good one). Full of roasted red chile flavor and something deeper, possibly some meat. The pork in the adovada was shredded, tender and near perfect. I usually leave the pinto beans (refried and mashed instead of whole) on the plate. Not this time! Must have been the lard? 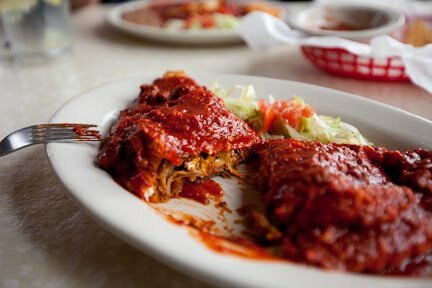 Can’t wait to return and try the chile rellenos. Hope they aren’t egg roll skin fakes, but something tells me that they won’t be. Tight, succinct, informative – great photos – love it! Wow, this is really going to make me hungry, but I am already excited to see what will be next on the menu!